With the end of 2017 approaching, and in conjunction with the publication of the Atlas of the World, 24th edition, today we launch our efforts to decide on what the Place of the Year (POTY) 2017 should be. Many places around the world (and beyond) throughout the past year have been at the center of historic news and events, but which location was the most noteworthy? To get an idea of what stood out most, we turned to the people of New York City at Bryant Park and asked them what they thought the Place of the Year should be. Perhaps unsurprisingly, many New Yorkers agreed that the Big Apple deserved to win the POTY award for 2017. Other answers included Istanbul, Charlottesville, and North Korea. We also asked our colleagues at Oxford University Press for their help to create a longlist and they all came back with some interesting and significant nominations. So now we open up the question to you: what do you think should be the Place of the Year for 2017? With your input, we’ll narrow the list down to a shortlist to be released on 21 November. Following another round of voting from the public, and input from our committee of geographers and experts, the Place of the Year will be announced on 4 December. In the meantime, we’ll be posting here regularly with insights on the POTY contenders. Vote in the poll below by 17 November. Or, if you think there’s a place we missed, please let us know in the comments. We thank the Bryant Park Corporation for assistance with the creation of our video. Featured image credit: THE REMEDY IS TRAVEL by Andrew Neel. CC0 public domain via Unsplash. 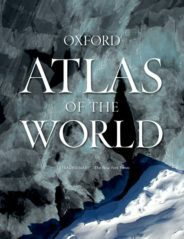 The only world atlas updated annually, guaranteeing that users will find the most current geographic information, Oxford's Atlas of the World is the most authoritative atlas on the market. Providing the finest global coverage available, the Atlas of the World is not only the best-selling volume of its size and price, but also the benchmark by which all other atlases are measured. Destructions by hurricanes of 2017 is number 1 on my list. Wiped out islands. It will take decades to get them back and running, if ever. With no guarantee of not being hit again. Of course there are many events of 2017 which are mind blowing, so its importance depends on persons affect by one. I think Antarctica should be on the list!